My friend and I saw Ice Age 2 last night. It was a full house show, and we both had a good time, but now that I think about it a day later, I think it could have been much better. I am huge fan of computer animated movies, with Toy Story, Shrek, Monsters Inc. being some of my favorites. Of course they are not as warm as the hand drawn cartoons that Disney made so famous, but there is just so much more fun in watching these computer animated cartoons. 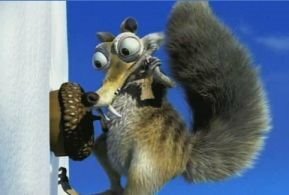 I wasn’t a huge fan of Ice Age initially because it left me feeling, pardon the pun, cold. The characters were not those who I could relate to, and I was hoping I would warm up to them in their second outing. Well, I didn’t entirely. The basic plot goes like this: due to global warming, the ice caps are melting creating huge lakes everywhere, because of which the animals have to move to higher ground and get into the boat a la Noah’s Ark to avoid being killed and eaten by the villainous vultures. That’s the basic story line. It’s very weak and very loosely held together. In between the wafer thin story, there is a parallel story of a squirrel who is on his hunt for this one nut which inevitably gets him into trouble each time he thinks he gets it. People were enjoying the squirrel story more than the main feature. There are a lot of issues/ messages given out in this film, which at times felt was being forced on the audience: family first, stay true to who you are, realize your potential, live your dream, it’s important to stay close to your friends even if they are different from you, importance of brotherhood, conquering your fears, and most importantly three cases of sacrificing yourself to save your friends. The movie worked great as a series of small comedic sketches, but sadly, nothing connected all these funny clips together. I felt like I was watching 10 mins comedy clips and not a cohesive movie. Not a bad movie, but not a great movie either.